With Ontario summer comes hot humid weather (or so it is at the moment!). Humidity and trailers don’t go together so well. Alas, comes the issue of humid closets and clothing. With moisture in freshly washed clothes comes a not-so-fresh smell several days later. So in order to tackle this, we needed some sort of dehumidifier. Without wanting to generate even more heat through an electric dehumidifier, I found an incredible product on the market that has served us from the beginning of our RV adventures. When I first initially did some research, I stumbled across an economical alternative at our local Co-op store in Teeswater. 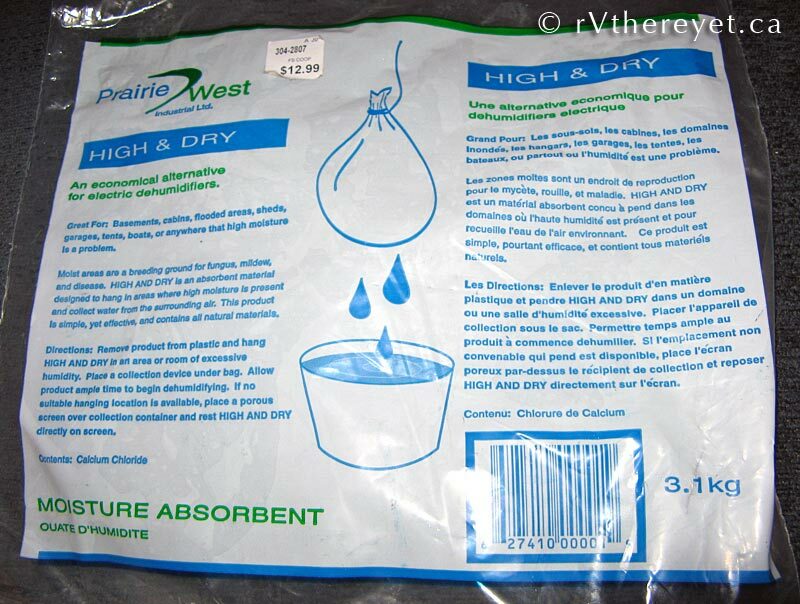 It’s called ‘High & Dry’ from Prairie West Industrial Ltd. and is made in Winnipeg, Manitoba (Canada). In our travels, I’ve looked for this product everywhere, but so far have only seen it at the one Co-op store close to my Father’s Canadian farm. 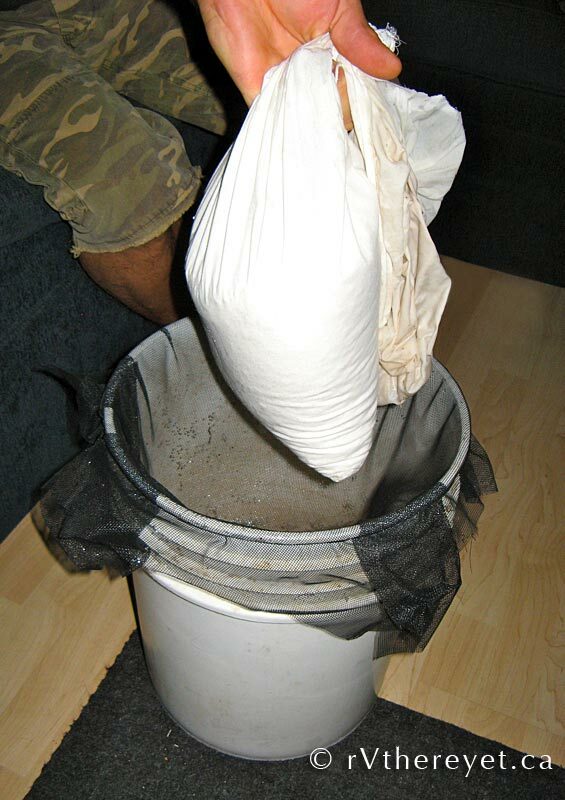 The 3.1 kg bag is dubbed as a moisture remover for basements, cabins, flooded areas, sheds, garages, tents, boats, or anywhere that high moisture is a problem. It’s basically Calcium Chloride in a burlap bag. Since my discovery of this product almost 2 years ago, we have gone through 4 to 5 bags. At around $15 per bag, it’s a very affordable and convenient option. Dependant on the season and destination, the bag lasts us on average for about 3 months and works impeccably well. The diagram on the front of the packaging shows the 7 lb bag secured by a hook over a pail. At first, I thought perhaps I could hang the bag from the affixed shower head but realized that such a heavy item would ultimately pull the faucet from the wall at some point. This called for an alternative resolution. With such a smart creative husband, he came up with the perfect solution. slaDE macgyvered a makeshift collection bin by securing porch screen material loosely over a 5 gallon pail with his work tie-wire. We set the bucket in the shower and it wicks away moisture from throughout the Airstream fabulously! 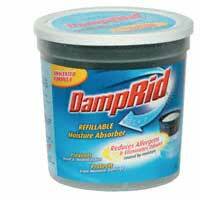 Another dehumidier option that we’ve invested in is the product called ‘Damp Rid‘. I bought 2 small containers, one to keep in the closet and the other in my electronics drawer. These containers are topped up at the end of my ‘High & Dry’ contents life end (small remnants of calcium chloride replenish these containers every 3 months … therefore renewable and more eco-friendly than just pitching after 1 use). Safe, non-toxic, natural defense against moisture and mildew. Renewable Eva-Dry dehumidifiers are filled with silica gel, a very thirsty substance. Odorless silica beads absorb many times their weight in moisture and lock it in so water can’t leak or spill out. 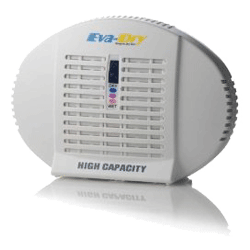 When the Eva-Dry is “full” you renew the silica inside by plugging the unit into any power outlet. Heat gently releases water vapor in a few hours. When the indicator is blue again, Eva-Dry is renewed and ready to go back to work. You can repeat the process for up to 10 years! I actually saw this product advertised a few months before purchasing and was somewhat leery about it’s proclaimed capabilities. However, I was happily surprised! Here’s a testimonial: we’ve used the Eva-Dry 500 now for the past 3 months, and I must admit, it has worked extremely well in our closet. In fact, I hope to buy another one to use for the rest of the RV (to replace the Calcium Chloride — if it works as well as the ‘High & Dry’ now, Eva-Dry will pay for itself after 9 months – 1 year comparatively). We’ve plugged it in twice over the past 90 days and I LOVE the fact that this is ‘rechargeable’. There is no need for batteries, chemicals or a purchase every few months. When plugged in, we need an outside power source to ‘recharge’ the silica pellets. So far so good! I like the colourant in the pellets which tell me when the unit needs to be replenished (when they turn bright pink, it’s time to plug the somewhat heavy device in for approximately 12-14 hours — we use a power bar to have it sitting upright during the discharge. The website recommends that “the best place to renew the Eva-Dry is in any well ventilated area or in a bathroom with the exhaust fan on”). So far, all the alternatives have been great effective options. Economically, Eva-Dry seems to outweigh them all. The ‘High & Dry’ has been the most visibly effective humidity deterrent (to give Eva-Dry a fair chance, we need to buy one for the whole trailer). I’m happy with them all and use all three at the moment for removing moisture in the trailer. I recommend them all! PS I’ve just discovered online that you can go to a pool store and purchase Calcium Chloride. Not sure if it would be cheaper than the ‘High & Dry’, or packaged as conveniently, but it’s an option for y’all! You can also go to a garden store or anyplace that sells garden supplies or aquatic supplies and buy small to large plastic "net pots". The SMALL ones can be hung in closets. http://www.hydr​oponics.net/c/1​66 to see the pots. They come in sizes from 1" in diameter up to 12 or 14 inches. They're great. They allow for the circulation of air and moisture and are cheap too! Use stockings – like the pantyhose footies you can buy cheap at the dollar store. Pour your calcium chloride in that and set it in the pot. When I full-timed I used them in my closets and it worked great! You can put more chloride around in the really moist places – under cabinets, in the bathroom etc. and you can hang the small ones from the closet rod. Good luck with it! I read that the hanging closet 'DampRid' packs include a rather strong artificial fragrance. Best to stay away from them if you have any chemical sensitivities.